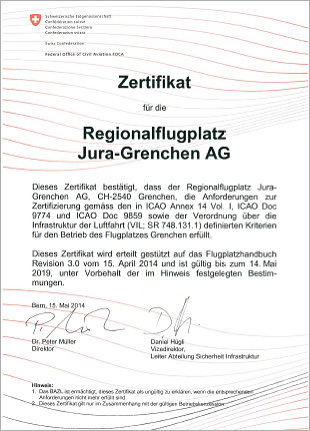 Holder of the licence and operator of the Airport is the public-private company, Regionalflugplatz Jura-Grenchen AG, called RFP. It is not actually a flight operator itself. This is ma­na­ged by local partner firms at the Airport. Click the panoramic photograph Winter 2012 / 2013 (1.15 MB) to enlarge. Click the panoramic photograph Summer 2009 (3.98 MB) to enlarge.